Colleen Flynn was born on March 23, 1952, in Orange, CA, to John P. “Pat” and Frances (Gassen) Flynn. The daughter of a Marine Corps aviator, she lived in many different places and attended many different schools before her family settled in Gregory in 1966. Colleen attended Gregory High School where she excelled in music and enjoyed the companionship of her classmates. After graduating from high school in 1970, she attended Northern State College where she sharpened her saxophone skills and earned a degree in music education. After serving two years as the band director at Andes Central High School, Colleen entered Marine Corps Officer Candidate School in Quantico, VA, where she was a member of the historic first class of women candidates who trained side-by-side with men. 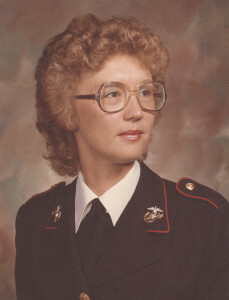 Colleen was commissioned as a Marine Corps second lieutenant in 1976 and for the next 22 years served as an aviation supply officer. She rose to the rank of lieutenant colonel, and in the process she received numerous awards and commendations for her professionalism and expertise. Many of Colleen’s fondest memories were of the adventures she had with her daughter Megan while they were stationed at bases throughout the United States and in Okinawa. After retiring from the Marines in 1998, Colleen moved home to Gregory where she cared for her mother and daughter and involved herself in a wide variety of church and civic activities. She served as the Gregory High School band director for one year and taught piano lessons to local youth. She contributed greatly to the spiritual life of St. Joseph Church by initiating, leading, and participating in many church ministries to the benefit of the parishioners. Colleen also did volunteer work for the Republican Party of South Dakota. Colleen’s last professional assignment was as the reporter for the Gregory Times-Advocate, a position she held until her death. She loved working with the newspaper’s staff and with community members and took seriously her role as the chronicler of Gregory lives and Gregory events. For all of her professional and community activities, the center of Colleen’s life remained her daughter Megan, her son-in-law Matt, and, especially, her grandchildren, Jaxson and Eva. Colleen was a wonderful mother and very active grandmother who was always seen at events involving her grandson Jaxson. Colleen passed away suddenly on July 17, 2017, at Avera McKennan Hospital in Sioux Falls. She was 65.